Designed by MASS Design Group, who have offices in Boston and in Kigali, the memorial relies on sculpture, art, and design to contextualise racial terror. Developed as a meaningful site for reflecting upon the United State’s fraught history of racial inequality, the Memorial to Peace and Justice is a physical tribute to the victims of lynching during the period following the US Civil War. Initiated by Alabama’s Equal Justice Initiative (EJI), the site compels visitors to grapple with the painful truth of US history. Designed by Rwanda’s MASS Design Group, the memorial relies on sculpture, art, and design to contextualise racial terror. Displaying works that deftly explore this idea by artists like Kwame Akoto-Bamfo, Dana King and Hank Willis Thomas, the space also features writing from Toni Morrison and words from Dr. Martin Luther King Jr. Occupying six acres of land in Montgomery, Alabama, it is the very first national memorial to the US’s thousands of lynching victims. 4000 of these names are engraved on concrete pillars included in the space’s design. The video of the memorial below takes you on a journey through a familiar classical building type, but as you enter the ground drops below you shifting your perspective. You begin to realise that the columns evoke the lynchings that happened in the public square. As one continues through the memorial the columns rise higher and you're forced to reckon with the high number of those who have yet to be put to rest. At the centre of the memorial is a hill where the experience is inverted, as the dead stand in judgement of the living. There is also a memorial square with 800 six-foot monuments, each representative of a county in the United States where lynching occurred. "I hope it will be sobering but ultimately, inspiring," Bryan Stevenson, founder of EJI said of the experience he hopes visitors to the space will have. "I hope people will feel like they've been deceived a little by the history they've been taught and that they need to recover from that. Truth and reconciliation work is always hard. It's challenging, but if we have the courage to tell the truth and to hear the truth, things happen." 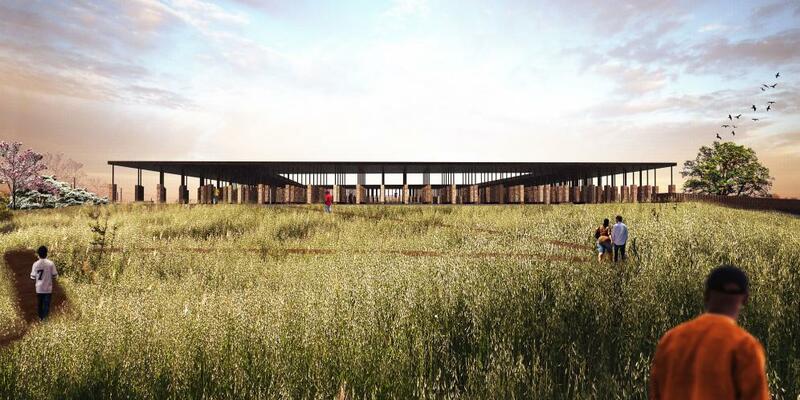 The Memorial to Peace and Justice is also the site of The Legacy Museum, an 11,000-square-foot museum that takes visitors on an educational journey, from the enslavement of African Americans to eventual legal racial segregation. To learn more about the Memorial to Peace and Justice, visit the official website here.